> I don’t think the Brewers could have finished their season in a more fitting way. After an early 6-0 lead, they fell to the Padres, 7-6, to end a season in which this situation so often plagued them. The Brewers scored six runs in the first three innings, with four of those runs coming from Travis Ishikawa (in what was likely his final game in a Brewers uniform). But after that, things went downhill quickly. The Padres got five runs between the fourth and six innings, including home runs from Chris Denorfia and Cameron Maybin. They then took the lead in the seventh off of Jim Henderson with an RBI triple from Chase Headley and a Yonder Alonso sacrifice fly. > I have to wonder if Ron Roenicke even tried to win this game. A day after taxing his bullpen by letting Tyler Thornburg go just four innings, he sits his ace, Yovani Gallardo, who could have easily given him at least seven innings. RRR instead started Josh Stinson, who he also let go only four innings, forcing his bullpen to go at least five innings again. So obviously the bullpen was going to get rocked, and I worried about that from the start. In this case, it is DEFINITELY the manager’s fault, and there’s no argument against it. > Aramis Ramirez left the game early after reaching the .300 mark. The standing ovation he got was pretty cool. > The Wild Card play-in games are tomorrow. It’ll be the Cardinals against the Braves (Kyle Lohse vs. Kris Medlen) and the Orioles against the Rangers (Joe Saunders vs. Yu Darvish). > Former Brewer Ben Sheets made what was probably his final big league appearance yesterday. He pitched the first inning of the Braves-Pirates game and struck out two. > Headley secured his RBI title with two RBIs yesterday. He finishes at 115, while Ryan Braun stayed at 112. > The Brewers needed eight strikeouts to tie the Major League strikeout record set by the 2003 Cubs, but only got six (despite Stinson not striking out a batter). If Gallardo starts, it’s almost guaranteed the Brewers at least tie the record. > Miguel Cabrera won the first Triple Crown in 45 years. With the regular season over and the Brewers not in the playoffs, there are going to be changes here at BWI in order to better fit offseason news. From now until the beginning of Spring Training 2013, here will be the new format: the biggest news story of the day (whether or not it’s a Brewers headline or not) or an opinionated article, the regular news section (Brewers news will always come first), postseason coverage (up until it ends), and the extras. The numbers might pop back every now and then, but I doubt there will be enough statistics to report over the offseason to consistently keep it is a section. I already have some opinionated articles in mind, but I’ll save those for days in which there’s nothing else to write about. 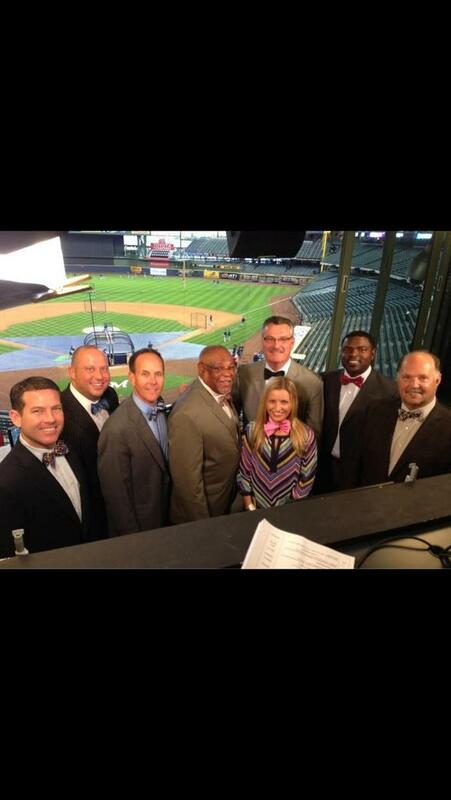 > The FOX Sports Wisconsin analysts continued the tradition of wearing bowties on the last day of the season. > The Braves are known for having one of the better bullpens and defenses in baseball. But neither were present tonight, as the Brewers handily took advantage of both of those absences to run away with a 4-1 win. Mike Minor was on his game, but pitch count got him. He needed 115 pitches to get through just 5 2/3 innings of shutout baseball. But it’s a good thing he needed all those pitches; there’s no telling what would have happened had he remained in the game. The first run of the game came in the fifth inning on an Andrelton Simmons double play; you know it’s a pitchers’ duel when the first run of the game scores in that way that late. The Braves put in Jonny Venters to start the seventh inning, but he would hand the Brewers the game on a silver platter. He gave up a single to Martin Maldonado and a walk to Jean Segura to start the inning. Jeff Bianchi then put down a bunt that was only meant to advance the runners, but Venters foolishly went for the runner at third base (who he wouldn’t have gotten anyway), and ended up throwing the ball away. That allowed pinch-runner Eric Farris to score and tie up the game. The Braves removed Venters for Chad Durbin, who let the floodgates open even more. After walking Jonathan Lucroy, he gave up a go-ahead two-run double to Norichika Aoki, who continues to show off his power stroke. Carlos Gomez tacked on the final run with a sacrifice fly. The bullpen was solid, with Jim Henderson and John Axford putting up scoreless innings to finish off the game. > Aoki has come out of nowhere lately as another power threat in the lineup. After putting up a few extra-base hits in yesterday’s game- including a game-tying home run in the ninth- he hit two more doubles today. > Wily Peralta was solid, going six innings while giving up a run on seven hits. He walked one and struck out four. Peralta actually looked pretty wild, at least early on. He threw close to half of his pitches for balls and worked behind in the count for the most part. But, with as good of stuff as he has, I suppose it isn’t that huge of a factor. > Corey Hart was out of the lineup tonight with an apparent injury to the arch of his left foot. He’s considered day-to-day for now. > In Ben Sheets’ first return to Milwaukee since he left in 2008, he talked to the media about his injuries and doubters since then. > The Astros released former Brewers closer Francisco Cordero. I’m guessing he’ll just retire now; after the year he’s had, I can’t imagine any team being even remotely interested in him. > The Braves got caught on the basepaths four- yes, four– times. Martin Prado got caught trying to take an extra base twice, Martin Maldonado picked off Freddie Freeman at first base on a snap-throw, and Maldonado threw out Jason Heyward attempting to steal second base. > I forgot that the Braves signed former Brewer Lyle Overbay to a Minor League deal awhile back. He hit a single in the seventh inning. The Brewers haven’t faced Hudson since May of 2011, and it wasn’t pretty. Hudson threw a one-hit shutout that day. In fact, that was the same day Zack Greinke made his Brewers debut. > A sweep at the hands of the Astros would have made the Brewers truly hit rock bottom. But, they were able to avoid a sweep by the worst team in baseball, defeating the Astros 5-3. Yovani Gallardo was able to go deep into the game, throwing 7 2/3 solid innings while giving up three runs on nine hits. He walked two and struck out eight. It was his longest outing of the year, and the second most pitches he’d thrown (114). Jose Veras came in to get the last out of what could have been a rocky eighth inning, then Kameron Loe recorded the save in the ninth (which was also pretty shaky). Gallardo had a rough first inning, giving up back-t0-back doubles to Tyler Greene and Marwin Gonzalez to start the game. But, Gallardo himself tied the game with an RBI single in the second inning. Rickie Weeks gave the Brewers the lead with an RBI fielder’s choice in the fifth inning, and Ryan Braun followed that up with an RBI groundout to make the score 3-1. Gonzalez’s RBI groundout in the bottom of the inning cut into the Brewers’ lead, but Corey Hart added an insurance run in the sixth on 22nd home run of the year. 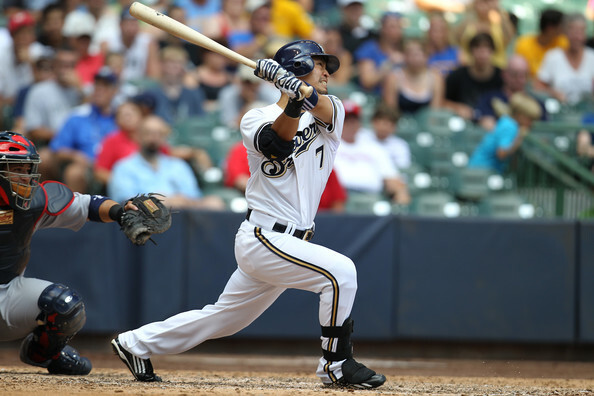 The Brewers added another important run in the eighth on Martin Maldonado’s RBI double. The last Astros run came on Scott Moore’s RBI single in the eighth. > The other day, Ron Roenicke announced that the Brewers might start monitoring pitch count and the number of innings that pitchers throw, also mentioning that a few could even be shut down. If you don’t already know, I’m strongly against pitch count and the emphasis it has on today’s game of baseball, so naturally I’m opposed to this idea. But let me explain why I think it’s useless. The only name Roenicke mentioned as to who would probably shut down is Mike Fiers, who is by far the best pitcher in the Brewers’ rotation right now. His 1.80 ERA makes him a legitimate Rookie of the Year candidate. So why even think about shutting him down? According to Roenicke, the Brewers want to “protect his arm.” After an eight-inning performance his last time out, Fiers is at 80 innings on the year (excluding 55 innings in the Minors). If you add those together, he’s at a total of 135 innings, and Fiers has never thrown more than 135 innings, which is RRR’s excuse to possibly shut him down. And that’s what I don’t understand. Not letting a young a guy throw more innings than he has before isn’t going to help him develop. He has to get out of his comfort zone and throw more innings; he’s in the Majors now. I do understand trying to protect his arm, but that’s pretty pointless, considering Fiers doesn’t have much injury history. For a guy like Mark Rogers, who has a ton of injuries on his ledger, sure, I can cope with not letting him throw as many innings until we know he’s back to 100%. But Fiers is at 100% right now, and is doing some of the best pitching the Brewers have seen in quite some time. So why take that away? Roenicke has also suggested going to a six-man rotation, which would also hold back the innings of each pitcher. I’m not for that, either, but at least the guys would continue to pitch, instead of being shut down for the year. If I had to choose between the two, I’d go with the six-man rotation. > Weeks was tried again at the top of the order, a role he lost earlier this year after his awful start. He went 0-for-4 with two strikeouts, so I doubt we’ll see him there tomorrow. > Two former Brewers took the mound today. Chris Capuano took a no-hit bid into the seventh inning against the Marlins before it was broken up by Jose Reyes. Ben Sheets will try to continue his astounding comeback tonight against the Mets, which will be broadcasted on ESPN. > The Cubs picked up former Brewers starter Seth McClung today, signing him to a Minor League deal. The Brewers tried McClung again this year in the Minors, but just couldn’t control the damage, so he was released two weeks ago. The Cubs have already tried something similar to this. 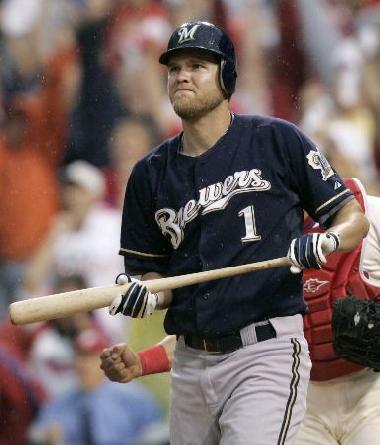 Last year, they signed former Brewer Doug Davis to a Minor League deal, and he eventually reached the Majors. But that experiment didn’t work out too well, and I doubt McClung will either. > One of the Brewers’ first round picks in this year’s draft, Victor Roache, was cleared to take dry swings today. He’d been out for over four months due to major arm surgery. > Jean Segura continues to improve at the plate, as he went 2-for-4 today. His average is up to .250. > Hart’s home run today snapped him out of an o-for-11 slump. > This was Gallardo’s third consecutive start in which he himself picked up an RBI. > Loe’s save was just the third of his career. > This play may have been the Brewers’ play of the year, and sparks some excitement for the Segura/Weeks double play tandem. > Hart technically had the only Brewers home run this series, but Mike Vassallo might disagree with that. > I don’t think any Brewers fan was expecting a sweep coming into this series, but that’s exactly what we got. The Brewers took down the Reds today, 3-2, in yet another low-scoring affair that was interesting until the final out. I was glad the Brewers won the first two games, because Randy Wolf was going today, and my confidence in him has waned over his past few starts. But, I forgot he was 11-4 in his career against the Reds, and that sort of showed today. Wolf threw six solid innings while giving up two runs on six hits. He walked two and struck out seven. But, he was being opposed by the red-hot Mat Latos today, who has been on fire ever since his 13-strikeout complete game against the Brewers back in June. After Dioner Navarro’s two-run shot in the third inning, it appeared that was all the support Latos was going to need. He went seven innings while giving up a run on just three hits. He walked one and struck out eight. The one run he gave up was a home run to another guy who has been on fire recently, Carlos Gomez. His homer cut the Reds’ lead in half in the sixth inning. Going into the eighth inning, the Reds still held that 2-1 lead. Latos was at just 97 pitches and could have probably gone at least one more inning, but Dusty Baker went all Ron Roenicke on him and removed him in favor of the bullpen. (The only difference there is the Reds actually have a good bullpen.) Anyway, Baker opted to go to setup man Jonathan Broxton, who was acquired by the Reds at the deadline and has been dominant since. But, with the Brewers having faced the Royals in Interleague this year, they had already seen Broxton, which may have given them the advantage today. Broxton started the inning fine, inducing fly-outs from Jean Segura and Jonathan Lucroy. But, Norichika Aoki got an infield single with two outs, and he was helped a bit by Broxton, who slowed it down and didn’t give third baseman Todd Frazier much of a chance at a play. After that, things just went downhill for the Reds. Aoki attempted to steal second base with Gomez batting, but the catcher Navarro fired it into center field, allowing Aoki to reach third. Gomez took advantage and hit a jam-shot RBI single to tie the game. After Gomez stole second, Ryan Braun hit a soft line drive into the left field gap, but Chris Heisey couldn’t make what would have been a highlight reel play, and it turned into a go-ahead double for Braun. Jim Henderson came on for the ninth and recorded the save. Hopefully he has that job locked down at least for the time being. Anyway, even though it may not look like much at the moment, I’m pumped that the Brewers swept the Reds. I’m particularly happy they jammed it down that obnoxious Reds fanbase’s throat. You can bet their excuse for losing this game was Braun being on steroids, even though it was a soft line drive. Those are the sort of fans I’ve ran into on Twitter lately, at least. > Manny Parra threw to live hitters for the first time since his injury. Parra never officially went on the disabled list, but has been sidelined for a few days with a shoulder impingement. > George Kottaras hit a home run off Zack Greinke today. Wait, what? > In the same inning Greinke gave up the home run to Kottaras, he walked five batters. All in one inning. That is not the Greinke we saw in Milwaukee through his year-and-a-half tenure, even when he struggled in the first half of 2011. Greinke’s overall ERA escalated to 3.74 today against the Athletics. > I haven’t mentioned anything about Ben Sheets yet, but he’s having a heck of a comeback with the Braves. He’s 4-1 with a 1.41 ERA in five starts with them. The Brewers could certainly use that right now. If he can stay healthy for once in his life, he could help the Braves go deep into the postseason. > Here’s my latest article at Reviewing the Brew. It’s basically me talking about Henderson, his story, his stats, and so on. I also mention the always-popular Brewers closer curse. > Henderson notched his second save in a row today, which is also the second save in his Major League career. He also lowered his ERA to 1.29. > The two other relievers who threw today, Jose Veras and John Axford, didn’t do bad either. Both had scoreless innings. But do I trust either of them yet? No way. > Segura notched his first Major League hit today, a fifth-inning single off Latos. With that out of the way, let’s see if he can become a productive force in the Brewers’ lineup. > The Brewers’ comeback win today was just the second time in 2012 that, after trailing going into the seventh inning, they came back and took the lead. That makes them 2-43 in those games. I suppose that stat explains what’s happened this season. > Braun’s double in the eighth snapped an 0-for-18 slump prior to that. His last hit had come on August 1st against the Astros. That slump dropped his season average to .304. Keep in mind Braun has only hit below .300 only once in his career. > Speaking of the Astros, that’s who the Brewers play next after an off-day tomorrow. The Brewers then play the Rockies after that. So don’t look now, but they could start a long winning streak. Anyway, I leave you with the probables for the Astros series in Houston. Apparently it’s become so bad for them that they don’t even know who’s starting until the day of. Mark Rogers (0-1, 5.91 ERA) vs. ??? Marco Estrada (0-5, 4.13 ERA) vs. ??? Yovani Gallardo (10-8, 3.79 ERA) vs. ?? ?